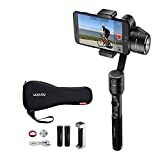 Trying to find the best gimbal for iphone depends on many factors such as price, battery life and ease of use. For me I need a gimbal that is easy to setup and use on a daily basis that can be used all day without worrying about running out of battery life. Price is a concern, but not as much as the other 2 factors. 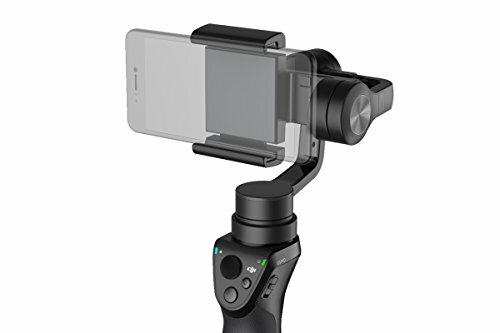 The DJI Osmo Mobile handheld gimbal comes with many very interesting features such as ActiveTracking and motion time lapse. DJI package design is very clean and simple. Once you open the box you will find everything you need to begin using the DJI Osmo. Unlike other handheld gimbals, the Osmo Mobile uses a twist locking mount instead the standard flimsy spring-loaded clamp. Just be aware that it can quite easy to over tighten and cause damage to your iPhone. Once tightened, you can be assured it will not come loose. One of the major reasons I selected the DJI Osmo Mobile over the original Osmo is the fact it doesn't come with a built camera. Since camera technology on smartphones constantly improve every year, there is always the possibility of using the Osmo Mobile that you bought today with iPhones that have far superior image quality and performance many years into the future. I really like how the DJI Osmo Mobile Handheld Gimbal looks and feels. The ergonomic handle is the exact same as the Osmo series and button's are identical too. The advantage of the DJI Mobile over the original is the fact that it doesn't have a built in camera which allows you to upgrade your camera (iPhone) at any time. As we all know, Apple releases a new iPhone each year with higher quality cameras and features. This is the main reason I would purchase the DJI Mobile over the original DJI Osmo handheld gimbal. 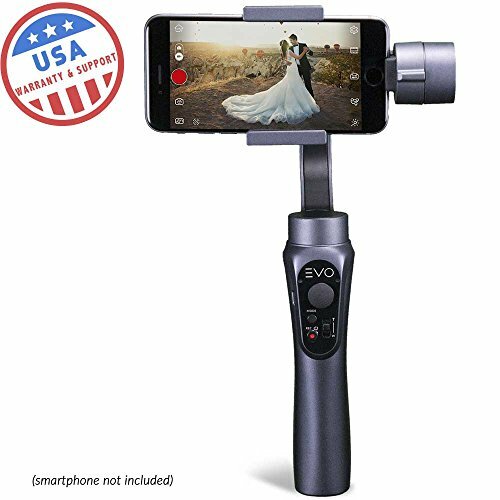 The EVO SP-PRO handheld gimbal eliminates shaky video and allows you to easily produce pro-quality, cinematic like footage with your smartphone and GoPro camera. The EVO GoPro camera adapter plate is sold separately on Amazon. It is made from CNC aircraft grade aluminum weighing in at only 265 grams unloaded. This highly engineered gimbal allows for 360 degrees of motion, enabling you to get the shot you want without a problem. Full Follow Mode: In this mode the gimbal will move both vertically and horizontally smoothing out you movements. Locked Mode: Roll axis is locked. Pan and Tilt axis smoothly follow handle. Use joystick left and right to adjust the horizon angle. Selfie Mode: Flips the camera around from front facing to rear facing. The app is fully integrated with the gimbal and can be controlled by the buttons on the handle. 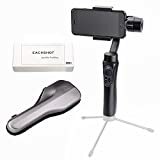 If you wanted to start and stop your recording, want to take a picture or if you want to zoom you can do all that right from the handle. With the EVO Smartphone App you can do some really amazing things such as motion time lapse and smart-tracking an object. You also can make adjustments to how responsive the gimbal reacts. The EVO Shift comes with a 1 year parts and labor warranty. EVO is a USA based company out of Oregon so you can be assured they will take care of you. You can contact them either by their support email address or call (866) 977-6688 Monday to Friday 9AM to 5PM Pacific Time. The EVO SP-PRO Gen2 handheld gimbal works with all versions of iphone smartphones. Built and supported in USA. The EVO Shift is the perfect low cost gimbal to take on vacation or video shoot. It is lightweight at only 450 grams and has a built-in lithium battery that gives you 12 hours of use. 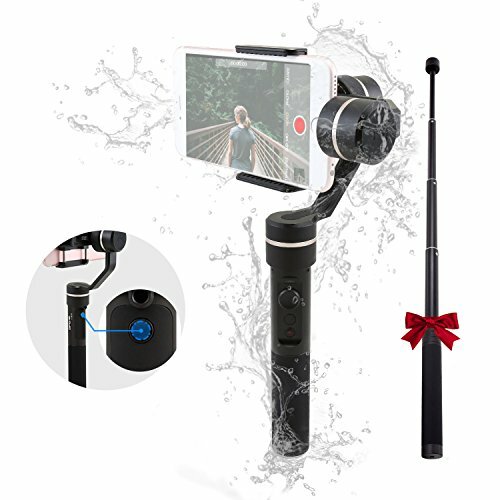 It is quite similar to the Zhiyun Smooth-Q gimbal but is covered by a USA built warranty that you can be assured will take care of you. The EVO Shift supports any Smartphone under 220 grams and a width of 5.5" or less. This covers even the largest and most recents Smartphones available in IOS and Android. With the EVO Smartphone App you can do some really amazing things such as motion time lapse and tracking an object. You also can make adjustments to how responsive the gimbal reacts. 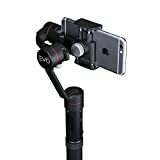 The EVO Shift 3-axis handheld gimbal for iPhone and Android smartphones is one of the best values. 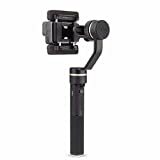 Features like tracking mode are not available with other smartphone gimbals in this price range. The full review of the EVO Shift Gimbal can be found here. The Feiyu SPG handheld gimbal one of several offering from Feiyu. Your iPhone is mounted to the gimbal using a strong spring-loaded mount. No additional tools are required to mount your smartphone. Unlike other gimbals, it comes with two counter balancing weights that you mount to the arm of the gimbal. Once you determine which one works best with your phone, the gimbal will self balance when you turn it on. The lithium battery giving you about 8 hours of use. It doesn't come with an external charger so you need to charger it from the microUSB port. As you can see from above the Feiyu SPG comes with a nice neoprene zipper case to store and protect your gimbal. The neoprene case fits nicely in a backpack or larger camera bag. The case protects your gimbal for scratches and drops. Feiyu SPG handheld gimbal worked as expected but I found the App quite limited and translations to English a bit off. I'd recommend you staying away from the SPG and going for something like the EVO or DJI if you can afford the additional cost. You will get a higher quality gimbal for more features using the App. 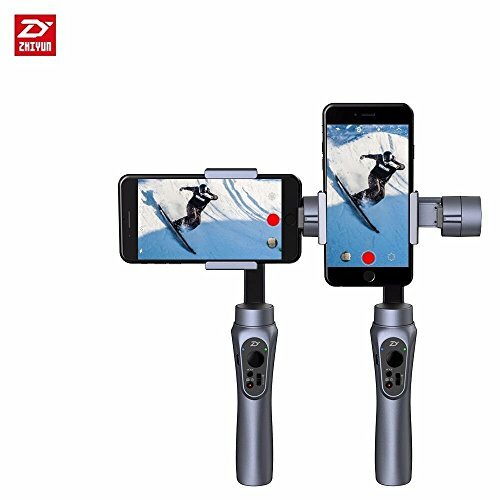 Zhiyun has been building gimbals for GoPro cameras and digital cameras for some time and now offers a low cost Smartphone gimbal in the Zhiyun Smooth-Q. At only 450 grams it's one of the lightest gimbals available. Made mostly of plastic, I was quite surprised when I took it out of the box. It's so light that I thought it was missing the batteries until I realized the battery was built-in. With a 26650mAh lithium battery you can get 12 hours of continuous use without needing to recharge. I've been using it for some time and it still says it has 3/4 battery left. In the same time period I've had to recharge my iPhone 4 times. I'd recommend you carry a large capacity USB power bank with you if your shooting at remote locations where a power outlet may not be available. There is a USB outlet at the base that you can use for charging your Smartphone while in use. I use an external charger between takes as I found the USB cable was distracting. As you can see from above, the Zhiyun Smooth-Q comes in a nicely designed box. Inside the box you will find the soft foam padded zipper case with shoulder strap. This case will protect your gimbal from minor scuffs and will fit nicely in a backpack. Inside this case you will find form fitted spots to store your gimbal and accessories. 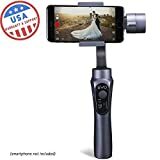 The Zhiyun Smooth-Q handheld gimbal is a great low cost option for those that are budget-minded but still want the ability to take cinematic videos with their Smartphone. For the price you will not find a better option. With the 12 hours of battery life you will not be worried about running out of power at least for the gimbal. Smart phones use a power when capturing 4K video so I would make sure you bring along a fast charge USB power bank or use the USB charging port on the gimbal. The AIbird Uoplay handheld gimbal for smartphones is made from series 7000 CNC aircraft quality aluminum manufactured by Foxconn which make Apple products. It has the same fit and finish as all Apple products and comes in the same common colors that iPhones are available. The gimbal weights in at 380 grams and is well balanced so you won't get tired while shooting your videos. It supports even the largest of phones. The spring-loaded mount allows for quick mounting and balancing of any Smartphone. You can download the App from the IOS Store or Google Play. Once installed, you will be able to control your smartphone from the gimbal. The App will also allow you to change the responsiveness of the motors manually. As with other quality gimbals you can also do motion time lapse and face-tracking. All you need to do is install the software on your phone and pair it via bluetooth. If you're looking for a gimbal built to the same standard as your iPhone, the AIbird Uoplay 2 is your choice. It is built by Foxconn and has the exact same fit and finish as Apple products. It's definitely feels the same and is built with high quality motors. As a blogger the only feature missing is selfie mode which I've come accustom to with my previous gimbal. If you can live without selfie mode and really want a product that matches your iPhone, the AIbird Uoplay 2 handheld gimbal is your pick.